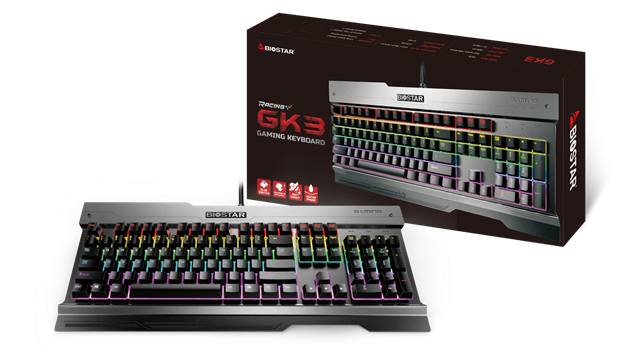 BIOSTAR is pleased to announce its latest addition to its gaming peripheral line-up with its first keyboard for gamers: the BIOSTAR GK3 mechanical gaming keyboard. 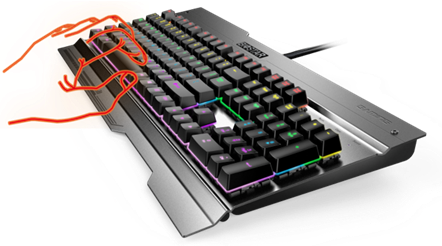 BIOSTAR combines all the key elements that gamers need and designs their first mechanical keyboard dedicated for gamers and what they really need: a durable and responsive keyboard aimed at the masses. Today’s gamers are becoming more competitive and response times are a gamer’s number 1 tool in victory. If your gear can’t keep up then your gear is keeping you down. Keyboards are the primary input for PC games and when a single keypress counts, a mere milisecond of input is the difference in winning and losing. The BIOSTAR GK3 mechanical keyboard will have an MSRP of $44.99. Mechanical keyboards have set themselves as the top choice for discerning typists and gamers that want improved responsiveness and feel that membrane keyboards just don’t have. The challenge has always been that mechanical keyboard have cost more than traditional membrane keyboards and that has made them inaccessible for many gamers that want to experience the benefits of mechanical keyboards. BIOSTAR has set its sight once-again on these gamers and their value-based company focus for product is ingrained into the new BIOSTAR GK3 gaming keyboard as well. 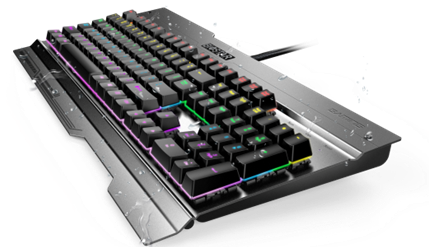 The BIOSTAR GK3 is built with an exquisite attention to quality with an aluminium metallic material forming the main body of the keyboard with a unique style for gamers. The BIOSTAR GK3 is also waterproof and dust proof with swappable keycaps giving gamers a highly-flexible weapon for gaming. BIOSTAR uses OUTEMU blue switches which are rated for 50 million actuations for a lengthy usage life and features anti-ghosting as well as anti-ghosting design which is perfect for gaming. The BIOSTAR GK3 also features 7 backlight modes for its lighting that allows users to customize their keyboard lighting or use pre-defined lighting styles for popular titles such as COD, LOL or other similar games. BIOSTAR uses a Alps-compatible stems which allows user to customize their own keycaps whilst offering more protection against dust with its larger surface area. BIOSTAR designs the GK3 mechanical keyboard with drain holes to protect against spills and the the Outemu keys are designed with a large surface area to minimize dust from entering the switches. BIOSTAR designed the PCB with the electronics on the underside of the internals with a special waterproof coating to further protect against liquid spills. The keyboard itself is sloped to channel water away for easy clean up.